Whether you want to protect a new table or give an old table a fresh new look, these fitted tablecloths will do the job beautifully. 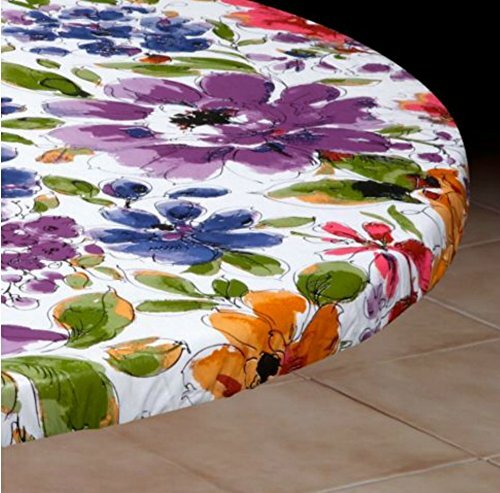 Our improved Vinyl Table Covers feature a heavy-duty elastic edge that holds tight for a smooth, neat appearance. We also added a thick flannel backing to help guard against nicks and scratches. And since the vinyl surface is moisture-proof, you won't have to worry about spills leaking through the table protector and damaging your table surface. Tough enough for outdoor use, the Vinyl Table Covers wipe clean easily. Imported. Oblong table covers have shaped corners for less bulkiness.